Pictured, from left, are Kristine Cronin, a speech pathologist from Willimantic, physical therapist Norma Lopez and Dr. Marghuerite Blaise. Dr. Marghuerite Blaise was a respected physician and medical director of the St. Luke Hospital in Port-au-Prince, Haiti. On Oct. 12, 2012, she suffered a stroke and was faced with the difficult transition of switching roles from physician to patient. Blaise had been in excellent health. She was of normal weight, with no hypertension, diabetes or irregular heart rhythms. She didn’t smoke. She had no particular risk factors for stroke, with the exception of a slightly elevated cholesterol level. The stroke occurred when a major artery bringing blood and oxygen to the left half of her brain became blocked. Unfortunately, the left half of her brain was the “dominant hemisphere.” In addition to paralysis of the right side of her body, she could not comprehend or produce speech. While recovering one month later, she suffered a second stroke in the same area of the brain, leading to more damage. 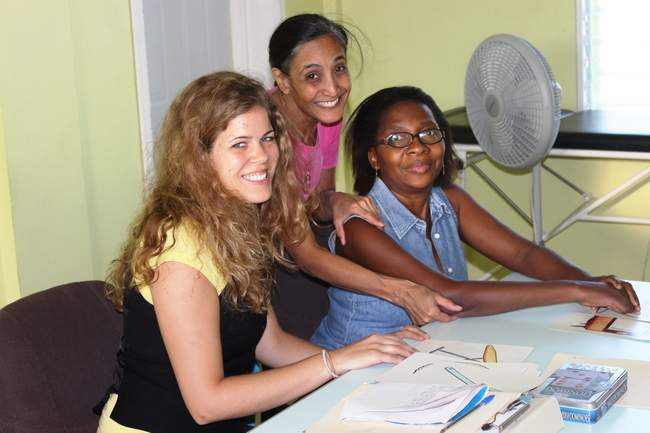 On my most recent trip to Haiti, in December 2013, I met up with Blaise, my colleague, while she was participating in a speech therapy session at the NPH Kay St. Gabriel Stroke Rehabilitation Center. I had not seen her since the stroke more than a year prior. She was her typical cheerful self. Although she remains weak on her right side, she is able to walk unassisted and understands speech. She can generate words slowly, but her vocabulary is limited. “Communication is essential to all human connections. Without that, we are alone. Early rehabilitation is essential,” said Kristine Cronin, a speech-language pathologist from Willimantic who is volunteering at the St. Gabriel facility. Cronin has been working with Blaise three days per week for the past year. Regular sessions of speech, physical and occupational therapy are crucial to stroke recovery. Through continuous use, the brain begins to adapt and utilize new pathways to regain function. Unfortunately, therapy can often be a daunting and frustrating task, especially for someone accustomed to working in a highly responsible role. Many patients quit. Rehabilitative services such as those provided by Kay St. Gabriel for Haiti are a rarity in the poorest country in the western hemisphere. Patients like Blaise must awaken early and endure lengthy commutes. Family members are needed for transportation to therapy. Each time I travel to Haiti, I learn more about the Haitian people. One characteristic remains constant in the face of the devastating earthquake in 2010 that was followed by a cholera outbreak and multiple hurricanes and tropical storms. It is their resistance to becoming disheartened that most impresses me. “Do not become discouraged. Always put in a huge effort, even when it is difficult. It is so important that anyone who has suffered a stroke attends therapy consistently,” Blaise said. Although Blaise cannot practice medicine at this time, she plans on starting a language and exercise support group to encourage other stroke patients. Dr. Blaise’s determination serves as a beacon of hope for everyone in times of adversity.